We hope you can join as for a weekend of festivities at the C-RS Cultural Center. As the space is limited (300 seats), please make your reservations early. Tickets: $15.00 purchased in advance. Visit http://www.harmoniaband.com for more information. Please come join us for brunch - this is a perfect opportunity to meet Professor Magocsi, socialize, and get to know each other! Free event located across the street from the Cultural Center. 11:00 a.m. | Pickup at the Cultural Center - $30/person. Dr. Michele Parvensky will present a discussion and slide show of the various types of architecture of the wooden churches of the Carpatho-Rusyns in Eastern Europe - Free event. “Why were there 5 different countries and how did it affect my life?” Karen Varian’s presentation takes us through the life of a Carpatho-Rusyn who was born in Austro-Hungary, went to school in Czechoslovakia, was married in Hungary, worked in the Soviet Union, and was buried in Ukraine. AWARDS DINNER AND DANCE HONORING PROF. PAUL ROBERT MAGOCSI AND ROBERT HANICH, M.D. Family style dinner catered by Emil’s Restaurant. The Harmonia Band will provide dance music. Price: $55.00 purchased in advance. Participate in our annual meeting to receive the latest organization updates, discuss goals and accomplishments and give us your valuable input! A block of rooms has been reserved at the Comfort Inn of West Mifflin and Holiday Inn Express & Suites, they are on a first come first served basis. To reserve a room at the special rate of $87.20 plus tax, please call: 412-653-6600 or 412-650-6011. You must give them our GROUP NUMBER: 3635461 in order to get the discount. 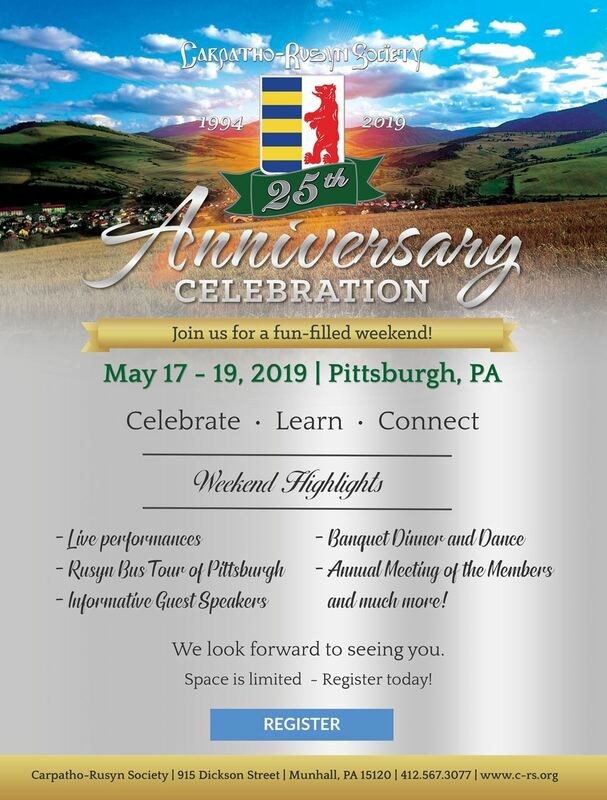 To reserve a room at the special rate of $89.00 plus tax, please call 412-469-1900 and specify you are with the Carpatho-Rusyn Society. Several registration packages are available, and registration can be done online. To do so, click on the link at the bottom of this page. 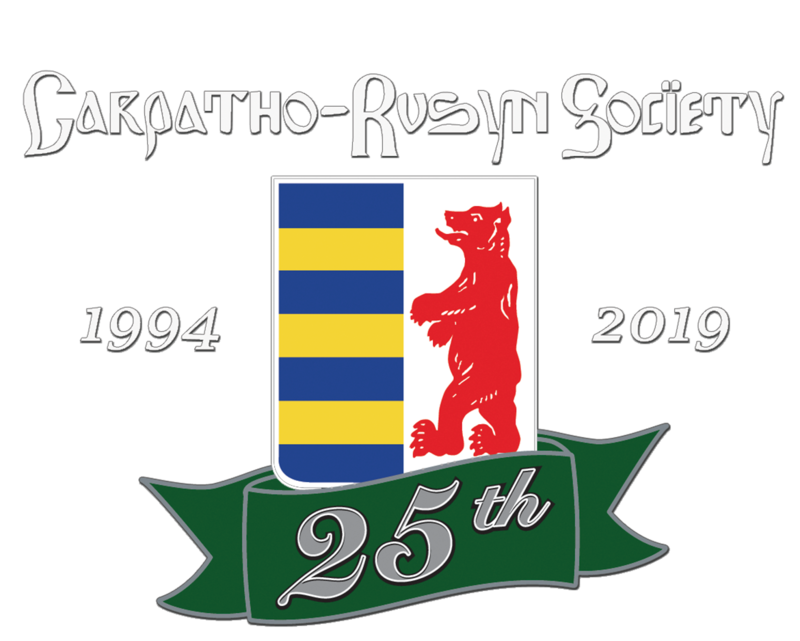 10 November 2018 Lake Michigan Chapter: "Our Flag Still Waves"
10 June 2018 C-RS President Emeritus John Righetti - Being Carpatho-Rusyn …its complicated!